PHILADELPHIA -- When Chase Utley announced his pending retirement July 13 in Los Angeles, he had July 23 in Philadelphia in mind. Utley declared his intentions out of courtesy to Phillies fans, even though the prospect of all that love and affection in his return to Citizens Bank Park made him squirm. Unless the Phillies and Dodgers meet again in the postseason, this week's series will mark Utley's final trip to Philadelphia as a visiting player. A crowd of 33,753 didn't waste an opportunity to show Utley that he is -- and always will be -- beloved in this city. Utley popped out of the dugout and waved when PA announcer Dan Baker announced his name during pregame introductions. He received a second, 50-second ovation when the public address system played his old Phillies walk-up song, Led Zeppelin's "Kashmir,'' before his first plate appearance. Then came ovation No. 3, when many fans stood and cheered as he flied out to the warning track against Phillies starter Zach Eflin. Before the night was through, Max Muncy, Yasmani Grandal, Chris Taylor and Joc Pederson hit solo homers, and the Dodgers rallied to beat the Phillies 7-6. But from a sentimental perspective, the night belonged to Los Angeles' silver-haired, 39-year-old, part-time second baseman. Utley established himself as one of the most popular athletes in Philadelphia sports history with his leadership, production and fundamentally sound play during the Phillies' run of first-place finishes from 2007 through 2011. He made five All-Star teams and won four Silver Slugger Awards before injuries put a crimp in his skills and his playing time. In August 2015, the Phillies traded Utley to the Dodgers for minor leaguers Darnell Sweeney and John Richy. Monday's game was a wall-to-wall homage to Utley's tenure in Philadelphia. From one at-bat to the next, the outfield scoreboard flashed photos of him in the Long Beach Little League, turning a double play as a collegian at UCLA and signing his first professional contract with the Phillies as a first-round draft pick in 2000. There was also a video montage of Utley highlights with accompanying sound from Hall of Fame broadcaster Harry Kalas. After a first-inning fly ball, Utley didn't have much luck at the plate. He grounded out with the bases loaded, was robbed of a hit on a diving catch by Phillies center fielder Odubel Herreraand finished the night 0-for-4 when Tommy Hunter snagged his sharp comebacker and threw him out at first base in the eighth inning. 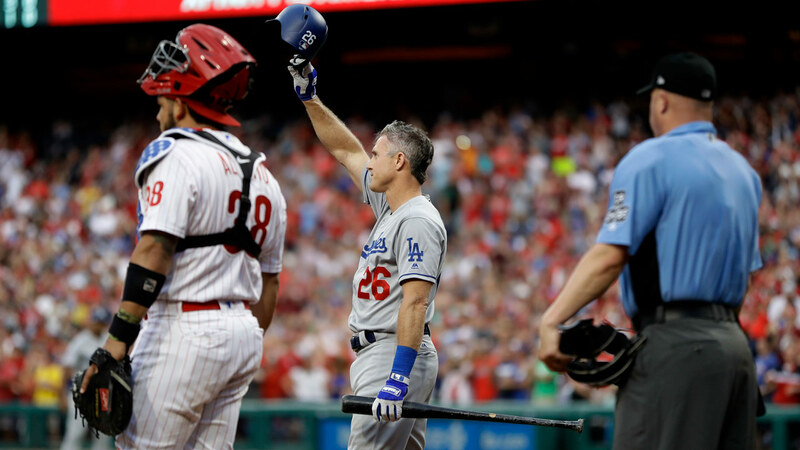 The box score line was nothing like Utley's first trip to Philadelphia as a Dodger in August 2016, when he hit two home runs in a 15-5 Los Angeles victory. Before the game, Utley answered questions on a variety of topics from the Philadelphia media for almost 20 minutes. He took a pass when asked if his career achievements are Hall of Fame-worthy and said he has yet to decide if he's interested in managing or coaching one day. He only knows that he would like to remain involved in baseball in some capacity. Utley waxed nostalgic about his relationship with Phillies fans, several of whom told him through the years that they named their sons "Chase'' in his honor. He expressed disappointment that he won't be in Philadelphia on Aug. 5 to take part in the 10-year anniversary celebration of the Phillies' 2008 World Series victory over the Tampa Bay Rays. Utley and the Dodgers will be wrapping up a three-game series in Houston that day. But Utley has made a point to keep in touch with Jimmy Rollins, Ryan Howard, Shane Victorino, Jayson Werth, Pat Burrell and several other old Phillies teammates through the years. "It's a relationship that I never take for granted,'' Hernandez said. "Not a lot of people that played with him or saw him play have gotten to see the side of Chase that I've gotten to see. I'm fortunate that I've built a big enough relationship with him that I can call him one of my best friends on the team, if not my best friend on the team. Hernandez and the other Dodgers watched Utley go outside his comfort zone in acknowledging the cheers from the Philadelphia crowd on Monday. Utley has only 16 at-bats this month, so it's no lock that he'll be in the starting lineup for the next two games in this series. Regardless of what transpires, he is relieved to have the latest personal tribute behind him and be able to concentrate on what matters most.